Jewish Community Relations Council | San Francisco: A City of Bridges or Walls? San Francisco: A City of Bridges or Walls? The Economist’s cover story, “Drawbridges Up,” highlights a new political phenomenon that’s upending traditional right-left lines in the West: the debate between open and closed societies. In both the U.S. and Europe, we’ve seen drawbridge-up candidates ascend on platforms against immigration and trade with other nations. Economic insecurity fuels blames on globalization, empowering those who incite violence against newcomers, racial and ethnic groups, and trade of various forms. Those who fear the consequences of immigration and internationalization are rallying to bring the bridges up, while those who see benefits of open borders and trade want to keep their proverbial drawbridges down. San Francisco prides itself on being a global city, one that attracts people from all over the world. We’ve long told the world that we’re the refuge for people who feel like outsiders. Our reputation is one of radical acceptance, pushing the envelope on what it means to be American long before the rest of the country catches up with us. San Francisco wouldn’t be San Francisco without its LGBT community. If newcomers in the 1960s and 70s hadn’t transformed the Castro into an unprecedented haven of acceptance, it’s hard to imagine what life would be like here. The same could be said for how other communities have shaped a wide array of neighborhoods, as well. But now we are failing to continue this proud legacy of radical inclusivity. When I look at the housing crisis, it feels that the same “drawbridge up” mentality is undermining our city’s tolerant values. In a previous piece, I mentioned how the debate around housing is bringing out the use of words of war and violence (in this case, “ethnic cleansing”). While the crisis here is indeed acute — especially when looking at the challenge of wealth inequality nationwide — I’m greatly alarmed when I hear politicians talk about the desire to “preserve neighborhood character.” Instead of character, how about building space for more characters? Many well-meaning people might think “neighborhood character” means pretty Victorians, but it has just as much to do with race and ethnicity. Irish Catholics dominated the Sunset, Mission and Castro before they became heavily Chinese, Latino and LGBT, respectively. The same can be said of SoMa and the Fillmore: both had significant Jewish communities long before the areas became home to African American, Filipino, and LGBT San Franciscans. Of course, politicians aren’t calling to preserve the Irish Catholic or Jewish “character” of these neighborhoods, nor should they. We should all know by now that housing is a civil rights issue. The Jewish Community Relations Council, where I work, was involved in the historic fight here in San Francisco to remove racist covenant laws from city books. And we continue to grapple with how to make tangible amends regarding extraordinarily real racial injustice in this country. One area remains constant: The consideration of race or ethnicity cannot be used in determining where you are allowed to live. It’s illegal, plain and simple. But instead of fighting for a sustainable housing market, we see many politicians and activists preying on fears of a changing city to pander to San Franciscans along ethnic and racial lines, in addition to blasting the presence of successful industries in the city, as a means to prevent housing construction. San Francisco cannot keep lying to itself that it’s a progressive and welcoming safe haven when it continues to practice the very politics it claims to reject. 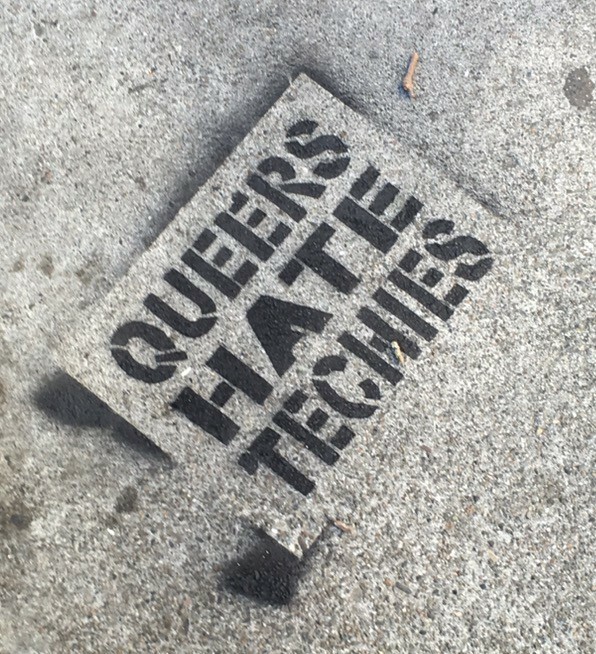 We see this rhetoric all over the city, including with “Queers Hate Techies” sprayed on the pavement all over the Castro and Mission. That’s hardly the sign of a city that claims to be a refuge for all. It’s become permissible to reject queer people who work in tech these days, so it seems. And it’s the same activists who hold these hard line beliefs who fight housing in the first place. It is a betrayal of our progressive social contract to not build market rate and affordable housing. We live in a capitalist country where supply and demand exist. The status quo only leads to a dramatic increase in housing costs. And it forces middle and lower-income residents to live in environmentally destructive sprawl, with some people commuting to the Bay Area from Tracy, Stockton, and Modesto in the Central Valley. For San Francisco to function sustainably, we need to increase the construction of three and four bedroom units if we ever hope to keep families here; we already have the nation’s lowest population of children of any major city. We cannot rely on one bedroom luxury condos to fix this crisis. Entire communities are at stake. We’ve seen San Francisco’s African American population dramatically plummet from 13% of the city’s population in 1970 to less than 6% today. San Franciscans are taking notice, even as there remain diverse opinions among African American leaders as to how to address it. Some want to initiate a “Marshall Plan” to help keep African Americans in the city, others want to address the overall affordability crisis as it impacts everyone, and people like former Mayor Willie Brown believe it’s best to not “engineer” San Francisco’s ethnic population beyond ensuring equal opportunity and access to resources. Sadly for many of us in 2016, it frequently feels that some want to proverbially shut down the Golden Gate and Bay Bridges, shut down the BART tunnels, and build a wall along our border with San Mateo County before letting anyone else move here, especially when many end up being on the lower income scale. History shows that open, diverse societies experience the most economic growth and social cohesion. San Francisco is booming because of it. Just as those who act out of fear of newcomers do more harm than good by bringing the drawbridges up, so do we hamper ourselves by not providing a accessible city with a focus more on communal well-being than “character.” But it’s simply not enough to think that living in a “Blue State” means that we’re getting it right. For the sake of all of us who call San Francisco home and want it to remain a socioeconomically vibrant city, let’s look for every reason to keep our drawbridges down and hearts open.